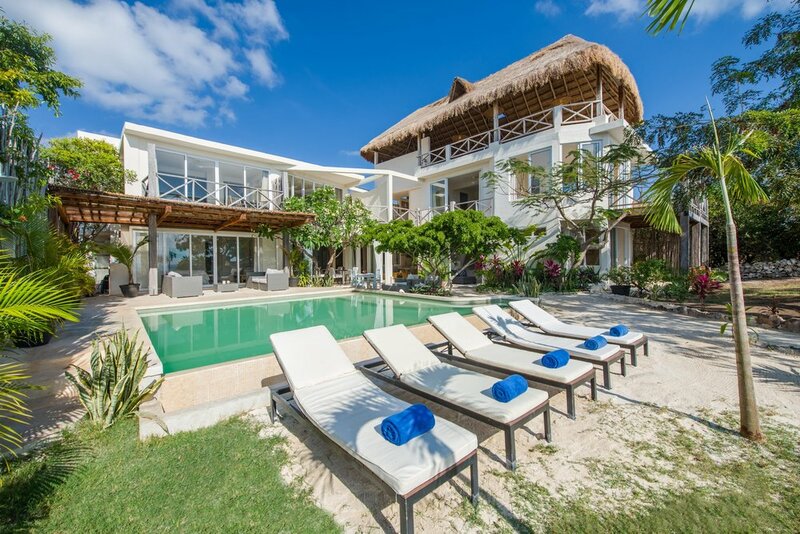 A unique oceanfront hideaway in the beautiful and colorful Isla Mujeres, Mexico on the Caribbean sea. Our team of chefs, concierge, event planners and co-hosts will work with you to create a bespoke retreat and an exceptional experience. Steps from the ocean and surrounded by picture perfect turquoise waters, Coco offers a sanctuary for relaxation and restoration. Western sunset views, a white sand beach, paddle boards, kayaks and a stunning 20 person yoga palapa are available to enhance your retreat. Depending on the length of the retreat and your itinerary, we can offer three adventures. We can include golf cart use so that your guests can explore the beautiful island. If there is a particular activity you'd like to include, we can do our best to arrange it for you. The villa offers 9 en-suite luxury rooms with air conditioning, ceiling fans and daily maid-service. 6 rooms have ocean views. Single, double, triple and quad occupancy options available. We can accommodate 4/5/6/7 night retreats. Base price per guest varies from $2600 - $4200 depending on retreat offerings. We can give you more accurate pricing per guest after we understand your specific needs. Share your passion in paradise, while making money. As all of our retreats are bespoke, each has a different price tag and teaching fees. On top of a mark-up fee per student, you receive free accommodation, meals and activities. We take care of payments, reservations, updating guests and everything once you arrive. Leave the work to us so you focus on what you do best.